GoodHost Review 2019: Is GoodHost a Good Hosting? Founded in 2009, GOODhost is a privately-owned hosting company that provides shared hosting, SSL certificates, and domain registration to individuals and businesses in the U.K. and the U.S. It's on a mission to help customers kickstart online projects and grow their businesses. GOODhost was founded by a small circle of blogging techies who wanted to provide fast and affordable hosting for customers in addition to reliable VPS and powerful dedicated servers. It leverages cutting-edge hardware and CloudLinux to deliver fast, stable, and affordable hosting services. I have been lucky enough to not host websites with providers that have a history of unexplained downtime. GOODhost seems to be faring well as it leverages enterprise-grade servers that run on the latest Intel E5 processors. Connected to powerful SSD drives, its servers deliver high performance all year round. Your web pages will load faster than on websites stored in conventional HDD storage. Migrating to a new hosting service is a challenge for many customers because they just don’t know where to start. GOODhost’s free website migration service can provide relief and let you move your website, files, and databases with speed. To get started, contact the tech support team and put through your request. They will take charge of the process (including multiple sites) and ensure your website is ready to use in a matter of hours. Once your website is up and running, you can bolster its security and performance by integrating it with the free CloudFlare CDN. It will save bandwidth and serve up your pages fast from any corner of the globe. A free Let’s Encrypt SSL is also available to GOODhost’s customers and they can use it to secure their web resources. The company also carries out a daily remote backup in multiple locations and it’s a great way of protecting key business data and files. GOODhost’s packages are fairly priced and come with pretty much all of the features you’ll find among the major players. When placing an order, you can choose server location (U.K. or U.S.) and pay conveniently via PayPal. You can pay for your contract annually, biennially, or triennially. For a reasonable fee, you can also get SiteLock and Premium SSL to secure your websites. At the time of writing this review, I was offered a 10% discount on shared hosting, which isn’t bad considering some services do so once in a while. Every hosting plan is backed by a 30-day money-back guarantee, meaning you can back out if you’re not happy with your package and get a full refund. 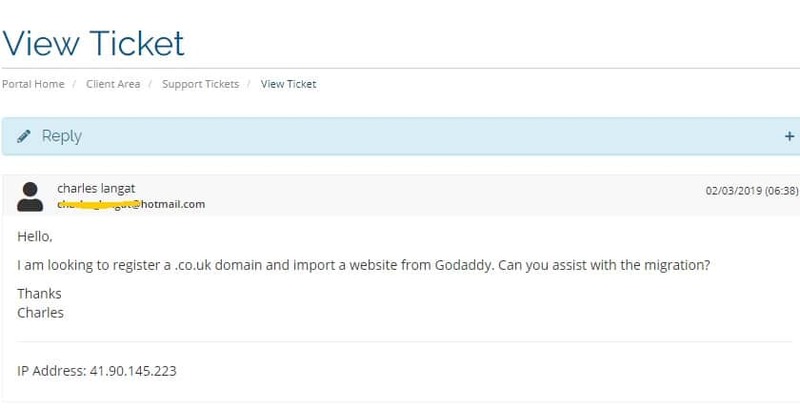 Unlike some hosting services which use chatbots and auto-responders, GOODhost leverages the expertise of a fast and friendly customer support team. Solution-oriented, they can resolve your hosting issues in no time. I do wish they were accessible via live chat as I wasn’t able to get a response within 24 hours of submitting a ticket. I encourage starters to check out GOODhost’s knowledge base as it provides answers to general support issues, common shared hosting/VPS problems, and sales/billing questions. With servers in the U.K. and U.S., GOODhost is a good choice for customers who want a mix of value in terms of performance, price, and reliability. Get U.K. & U.S. shared hosting from GoodHost! Wondering how GoodHost stacks up against other Web Hosting companies? Enter any other Web Hosting company and we will give you a side-by-side comparison.